This past weekend I went shopping for fish. Lately, I´ve been on another one of my health kicks and have decided to try and eat more bio- and eco-friendly products. 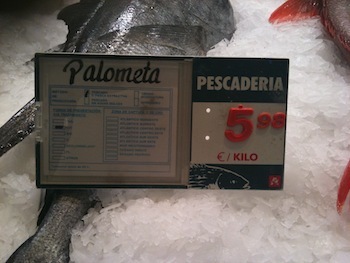 Thus, when I went to the seafood section at Alcampo supermarket in La Cañada I was a bit confused when I started to read the labels to figure out where the fish was actually coming from. I figured out that the Pescado en Agua Dulces probably meant that it was a fresh water fish. That was a good sign, but didn´t see any available. The next one was Marisqueo and I was told that this identified a shellfish. What I was more curious about was the difference between Pescado Extractiva and Criado Agricultura. I was told that the Extractiva fish meant that it came directly from the sea or ocean. Yay! What I was looking for. The Criado Agricultura meant that the fish is farm bred. Fresh fish from the sea was what I was looking for! So I asked the vendor which ones were from the sea. He pointed out all the red skinned fish such as Palometa (pompano) and Breca (bleak or bray). The problem here is that the natural fish from the sea was three to six times more expensive than the farm bred fish. Oy vei! I decided to give it a go and chose a small fish, because I was promised that I would notice a whole world of difference in taste and quality. I´m trying the fish tonight so I hope he is right. What I´ve figured out is that there is certainly a price to pay when going eco. Can you provide seafood for us? We are located in Ukraine and are interested in purchasing some seafood from Spain. Purplehead, red mullet (goat-fish/king-mullet), Grenadier, hake, Mackerel, Pacific moonfish. Por favor, tenemos que comprar los peces rojos de Brasil, volver a lo antes posible. Please, we need to buy red fish from Brazil, get back to me asap. Don't eat from the Med. Nº 2 is right; it is a slush-pool. Having been in the property market on the Costa del Sol for some years, I had to research where THAT stuff was going. Having also frequently collected water fleas for my Koi fish at the Cape Town/Muizenberg treatment plant, which pours clean water into the sea, I know how a treatment plant should look and smell. The treatment here on the coast is too fast but wait for it: I can show you places where IT goes straight into the sea. Now if you look at Merluza and other fish marked Cabo or Atlantico Sur or with the Pescanova label, it comes from the Atlantic south of Cape Town, FAR from THAT stuff. Also read in the Bible what kind of fish we should eat. Forbidden fish are mostly "bottom feeders" which eat THAT STUFF and anything dead and rotting. Hmmm. Interesting comment. 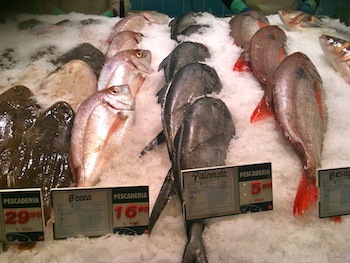 So do you think it´s safer to purchase fish that is bought from the ocean? Or is it better to buy farm raised? Now I´m really confused.